Ah yes, the Pimm’s Cup. If I had to pick one highball to drink for the rest of my life, this would probably be it. What? You’ve never had one? Fill a highball glass with ice, pour in the Pimm’s, pour in the soda. Stir to combine, then garnish. 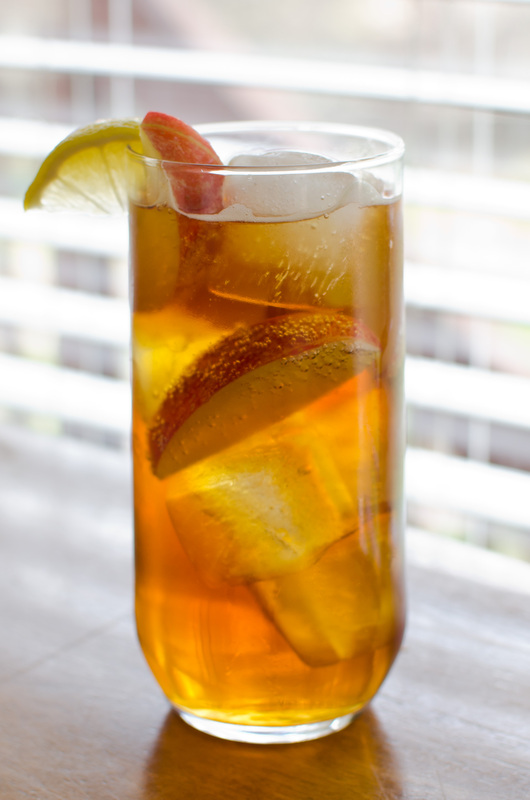 Fill a highball glass with ice, layering in the fruit of your choice, then add the Pimm’s and soda, stirring to combine. Garnish with fresh herbs. You can also muddle the herbs, berries, and fruit and shake briefly with the Pimm’s to extract more flavor. * When the Brits say “lemonade” they mean the sparkling variety (lemon-lime soda in Ameri-speak). The drink does work with our flat, “homestyle” lemonade, but it’s best with a bit of fizz, so just add soda water. ** Apples, oranges, lemons, limes, strawberries, raspberries, blackberries, cucumber, etc. Borage and mint are the herbs typically used as a garnish. By Jay Hepburn of Oh Gosh! Fill a 12-ounce with ice, then add the lemonade and Pimm’s. Top with 7-up and garnish with the slice of cucumber. Muddle the citrus wedges with the rich simple syrup, then add the Pimm’s and two large chunks of ice and shake. Strain into an ice-filled highball glass, top off with soda water, then stir to combine. There you have it! There are lots of ways to make a Pimm’s Cup, and so there are lots of arguments about the “proper” way to make it — such arguments are futile, as most cocktailian debates are (see Martini, et. al), as everything boils down to personal preference. The “City” and “Country” distinctions listed above come directly from Gary Regan’s Joy of Mixology, and I like the idea of contrasting a slimmed-down, sophisticated, urbane Pimm’s with the rustic and cheery countrified version. Walking around London in May, most of the Pimm’s I saw advertised in the cafés came in pitchers loaded with fruit, matching Jay Hepburn’s recipe listed above. Some Brits are adamant about the use of borage leaves as a garnish, with cucumber acting as a frequent substitute, but most folks are accommodating of the fruit-basket-in-a-glass idea. Thousands of attendees at Wimbledon can’t be wrong (though I hope the Pimm’s Cups served there best our mass-produced Derby Day mint juleps). Personally, I prefer wedges of lemon and Gala apples in my Pimm’s and ginger ale, mainly because that’s the way it was prepared when I first tasted one at the George Inn in Lacock. Having a Pimm’s-infused snack at the bottom of the glass is never a bad thing. I suppose you could also use ginger beer, but I enjoy the lightness and flavor of ginger ale here. Of course, as the San Francisco Chronicle reports, bartenders in the Bay Area have come up with a bevy of fanciful variations, not the least of which is cucumber foam. Oh, and Jason Wilson likes to muddle his Pimm’s, which extracts more flavor from the fruit but strains out the munchies. Pimm’s Winter Cup: Basically, the No. 3 brandy-based version, but with orange peel and spices added; marketed seasonally since 2005. Cups 2-5 were phased out in the 1970s, but No. 6 still makes an occasional appearance, and if you’re in the UK in the wintertime you can pick up the spiced Winter Cup. I’ve seen Pimm’s in just about every liquor store around Atlanta, but if you can’t find it and can’t bring yourself to mail-order a bottle, there are a number of substitute recipes. Among the first I ever ran across was Darcy O’Neil’s (trust him, he’s a chemist), which is strikingly similar to a Perfect Martini, of all things. You also have two recipes by Summer Fruit Cup — dedicated to good English gin and Pimm’s — which incorporate ginger wine, gin, and vermouth; also, see their tasting notes on using different bases for a batch of experimental cups (though they’re a bit short on the details). Jay Hepburn of Oh Gosh! suggests combining 2 parts gin, 2 parts sweet vermouth and 1 part orange curaçao as a substitute, though he notes that it’s more similar to the Winter Cup (he also provides a comparison between Pimm’s, Austin’s, and Plymouth cups, not that it makes much difference to us Americans, as we can’t find them here). Still, absolutely none of this explains why Pimm’s is so popular in New Orleans. Yes, it’s a very refreshing drink in hot, humid weather, of which the Crescent City has an abundance, but how did it get there? The only source I’ve found mentions that it arrived sometime early in the 20th Century. Perhaps it’s just as simple as a bartender at the Napoleon House saying, “Hey, it’s hot out and I know this great drink we can make with this stuff we just got in from England,” and the popularity snowballed from there. Perhaps the Napolean House text might say. What the Corsican would say about a British highball being sipped in his establishment, I dare not think. This entry was posted on March 19, 2012 by IJ Lauer in Drink Recipe, Ginger Ale, Ingredient Recipe, Lemon-Lime Soda, Pimm's, Recipe Comparison, Spirit Information.